We can all agree that having a soulful voice adds a little magic to any song you hear. Incorporate passion and truth into a creative composition and a good hook becomes enchanting and the performer becomes a wizard. Note after note, song after song, Zion Rodman is such an artist. His beautiful voice and high- caliber catalog are charming, inspirational and majestic. Read on and let him cast a spell on you. Noise: On the circuit you appear as both a solo acoustic artist and with a full band. What’s the difference in your performances? 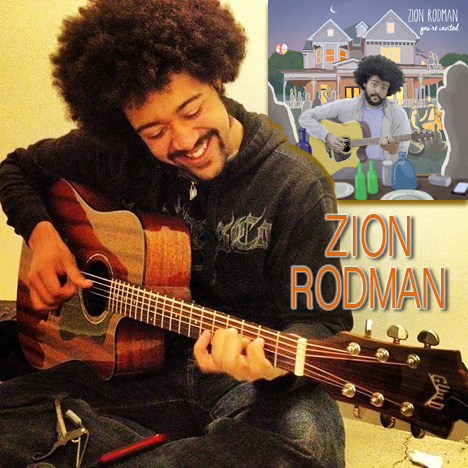 Zion Rodman: All my songs started on the acoustic guitar, so that’s them in their most natural form. But I like playing with a band because it’s an opportunity to open up more and have freedom with playing. I always have the full band playing in my head so it’s nice to hear those sounds realized. Right now I’m in a power trio with Ray Cohen on drums and Gray Gafarov on bass. Noise: You write your own material. Does some of your music get written with the specifically different formats in mind or do you render some of the same songs in both groups depending on where you’re playing and what mood you’re in? Rodman: Yes, I hear it as it would be played with a band in my head but I always figure out the way I’d play it on acoustic guitar first. Then I consider full band arrangements. Noise: You are releasing your debut album You’re Invited this month. What can we expect to hear on this? Noise: The party for your new music is on June 3 at The Burren, in Somerville, to showcase their Backroom Series. On the bill with you is Julia Mark whose soft, easy vocals are reminiscent of Suzanne Vega. Why did you choose her to share this special night with you? Rodman: Because I think JM is one of the best local musicians around. Her songs are thoughtful and well arranged. Her lyrics are insightful and she has something to say, it really shines through in all of her songs. We’re planning for Julia to join me on stage for some songs too. Noise: Is describing you as having a passionate and expressive voice, memorable lyrics and thoughtful compositions fair and accurate? Noise: Is describing your sound as soulful folk/ rock music true or false? Tell us where and how much each genre fits into your music persona. Am I missing anything? Rodman: Soulful folk/rock and indie rock is what people describe my music as, I’ve adopted that and I like it. I’d say it’s true. I’d say indie, singer/songwriter, acoustic genres also fit my music persona. Noise: You are a singer/ songwriter who plays the guitar, bass, piano and drums. How did this occur and which was your first instrument? Rodman: Drums was my first instrument when I was 13. About a week later I bought a really cheap acoustic guitar at TJ Maxx. Playing the bass and keyboard was to get a better understanding of how those instruments play in a band, and how to come up with ideas that are separate from the guitar for my arrangements. Plus they’re fun. Noise: Do you have a favorite way to write your songs or express their meanings with specific instruments? Rodman: I guess with me, most of the time, songs start on the acoustic with just the music by picking around, something nice usually comes out of that. Then when I’m in the mood to write lyrics is when it all seems to happen at once. I do have some songs I’ve written on piano, but those are for my second album. Noise: You grew up on Cape Cod and came to Boston a few years ago. Please briefly trace your history and who your music influences were then and who they are now. Rodman: When I was in middle school, I was into artists like Green Day, Incubus, and Third Eye Blind. That was what influenced me when I first started playing. I still love all those bands, but now I’m more influenced by really personal songwriters like Taylor Goldsmith from Dawes or Father John Misty. They’ve made me really want to be a better lyricist. Noise: For the past year you have been co- hosting a closed mic series in your apartment that features local talent from the Boston area. What’s the story behind this and please tell me some of the great artists you’ve had on your show. Rodman: My roommate had the idea one day but didn’t act on it, so last summer I posted the idea in the EBASS (Emerging Boston Area Singer/Songwriters) group and about 80 people said they were interested within the hour, so I knew we had to do it. I have a lot of singer/songwriter friends, the roommate has a lot of jazz friends, and my girlfriend organized the shows and made sure the featured artists knew what was going on and made sure they got paid. These shows are so much fun. The first hour is an open mic, then we have three 30 minute sets with featured artists, and after that we have a long jam session until everyone goes home. Here is a full list of featured acts in alphabetical order, they’ve all been great: Alec Hutson Trio, Andrew Di Marzo, Black Samurai and the Conscious Collective, Dan Cristo, Dan Martinelli, Dan Masterson, Florie Namir, Frank Bell George Woods, Jakals, Joanna Schubert, Julie Mark, Ken Budka,Louis Apollon,LuRose, Max Bailey, Prateek Poddar, Raley Delk, Sidestep Complex, Small City Mayor, That One Eyed Kid, Troll 2, Zion Rodman. Noise: Congratulations on winning the T Max White Rose Mic-O-Thon (singer/ songwriter competition). Care to share what this was all about and what went on at the event? Rodman: A bunch of musician from all around the area came to Lynn to enter this songwriting contest for the fame and glory and $500. I got first place in the preliminary, semi-final, and final round! Noise: What’s in the future for Zion Rodman? Rodman: Well, in the immediate future, this summer I’m quitting my job and will focus on music, playing shows all around New England to promote the new album, and will start recording the second one. Keep up with me on zionrodmanmusic.com to see what happens after that!